"Do you want to be awesome? people who have inspired us ..."
"... I realized there are three qualities that came together in a perfect storm to create the Kid President phenomenon. The one I've already mentioned is joy. Joy in tone and execution. And in the hearts and smiles of millions of viewers. The second is an obvious one - talent. Brad and Robby are brilliant together. Period. 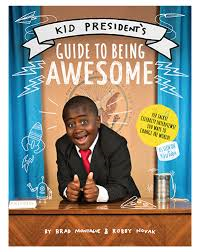 But the final factor that I think is often forgotten in what makes Kid President magical is the power of encouragement." "I remember one particularly rough patch when Robby was just 4 years old. Two back-to-back surgeries for femur rerodding resulted in him being confined to bed in a bright-red full-body cast. Going to visit him I was prepared to be tough. I had never seen him this broken and did not want to cry in front of him. Of course, he was the tough one. I walked in to see him lying on his little bed with a huge smile on his face, listening to music, and using the only body parts he could move (his toes, fingers, and head) to dance." If Robby could dance then, and continues to dance now, surely we can follow in his footsteps! "THIS is LIFE, People. You got air coming through your nose; you got a heartbeat. That means it's time to do something." You cannot come away from reading their wonderful, uplifting guide without feeling that you, too, can make a difference. Along the way, they provide 100 ideas for making the world a better place and show us the many people who are doing just that. They inspire each one of us to find our passion and get going at making change in our own small part of this big, beautiful world. Oh, good! A new addition to the very impressive (and outrageous) Disgusting Creatures series. The children that I have shared them with love them, as much as their parents and teachers do not. But, I don't believe that Elise Gravel wrote them to impress we 'oldsters'. I'm sure she had much more fun imagining how pleasing and funny they would be for young readers. It's a terrific series, and it never disappoints. Insects only have six legs. With her eight feet clad in pink heeled boots, and festooned with pert black bows, the spider smiles sweetly at her audience. 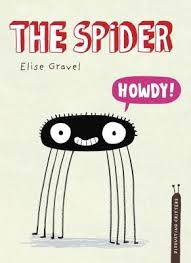 Every turn of the page furnishes young readers with new and pertinent information about the spider, while also providing a humorous running commentary that is certain to result in giggles. Disgusting? Indeed! Isn't that the best part? a leaf in a great river. cliffs rose up around him." 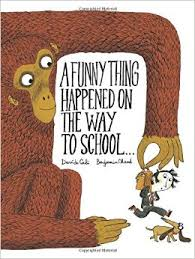 I had great fun reading this in school classrooms while celebrating I Love to Read month! The kids were wanting to stop me at every turn to tell me that the story in the artwork was quite different from what they were hearing with their ears. Isn't that the best thing about read aloud sessions with your own children and in classrooms? 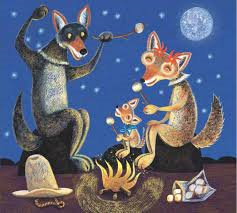 I love it when an author/illustrator can turn a tale on its ear, and delightfully entertain an audience. So, this book is 'spot on' for me! 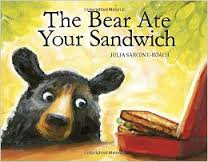 We have a narrator, who wants to ensure that we know EXACTLY what happened to our sandwich. We know from the 'get-go' that the bear is totally responsible. It begins in a verdant forest with a bear enjoying the brilliant day, and becoming even more excited when a nearby truck emits an irresistible aroma. The berries in the back fill his belly, and prompt a morning nap right where he is. Without the bear knowing it (because he is sleeping soundly), the truck begins a journey that is meant to take its cargo to a farmer's market in the city. The bear considers this place 'a new forest', and so many adventures arise. Everything is new, and undiscovered for the bear. We are witness to his exploration. A park bench holds a brand new taste treat; the sandwich is devoured in seconds! Only then does the bear hear unfamiliar sounds and realize that someone has seen him eat it. Surprised and embarrassed, he runs off and eventually makes his way home. Turn the page and the identity of the narrator is revealed, and a full-fledged explanation provided. The real culprit is now evident! Now, go back and read it again if you want to see the many clues that the artist imparts as the story unfolds. While doing so you will be able to immerse yourself in the wonderfully textured acrylic and pencil artwork, full of sunshine, movement and understated humor. There is so much to see on its pages, and to linger over as you share it repeatedly. I just looked carefully at the endpapers front and back ... mmm! Hungry! I am off to make myself some lunch. Preferably, a sandwich that no one else will eat! Parents will love this! I think that it is a perfect gift for a new family as it expresses hope for the future. More is what we all want for our children ... more happiness, more love, more friends. 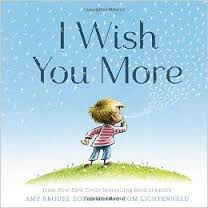 In a series of wishes, Ms. Rosenthal uses perfectly chosen language to bring an upbeat lightness to her newest book. 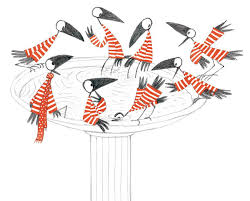 Tom Lichtenheld matches the tone (as he has done in other collaborative books with the author) to show happy, busy children flying kites, sharing snacks, hugging, tugging and chasing. The double page spreads are filled with light and warmth, with tough tasks and easier ones, with a sense of well-being that we wish for all children. Lovely sentiments, accompanied by familiar settings and a lively crew of active, happy children, this is a book that is sure to be treasured by the parents who share it and the children who keep it to read to their own children. My personal favorite: "I wish you more stories than stars." She likes her soggy bog. to look near their log." Calling all young scientists! 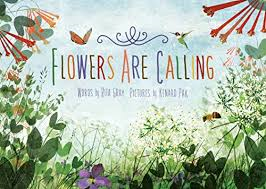 This quiet and effective book about plants, insects, animals and pollination offers encouragement to every person who reads it, or who listens to its words, to get outside and take note of what is happening all around us. "Flowers are calling a little black bear. No, not a bear! He doesn't care. to dip from the air." Kenard Pak's watercolor and digital media artwork fills the double page spread with a quiet scene that shows a bear cub emerging into a light-infused glade where perfect, delicate, and brilliant white Queen Anne's Lace is drawing the attention of equally delicate butterflies. In the next two spreads we see the same pattern for bumblebees and hummingbirds. Following that we are provided with short bits of information about the plants that attract them. On these particular pages, we learn about Queen Anne's Lace, Monkshood, and Trumpet Honeysuckle. The illustrations allow a clear, colorful look at each of them. "Flowers are calling a busy wren. No, not a wren! He's already seen them. A lovely invitation to be sure. In back matter, to encourage careful consideration of flowers themselves, she suggests that they look at color, pattern, shape, smell and time of opening. Then, she accompanies it with a further Would You Believe! section. "Flowers need pollinators to flourish, and pollinators need flowers for nourishment. A pollinator is any animal or insect that helps a flower to trade pollen with another flower like itself. Most flowers need to trade pollen with each other so they can make seeds. These seeds will then grow into new plants." Ms. Gray then offers up ways in which flowers 'call to' their own special pollinators, and makes a plea for us to learn more in order to assure a future for these lovely plants. "She used to reach through the bars with a pencil and poke the hamster off the wheel. One day, when Emma Pond's hamster had the chance, it bit Emma Pond. This happened on a day when Emma had not been able to find a pencil and had used her finger to poke him instead. It was not a little bite; it was a big one. As big as a hamster could manage." Luckily for the hamster, Emma Post knows just the person who will be happy to take that ungrateful hamster off her hands. As does everyone else who knows Lulu and her love of animals. 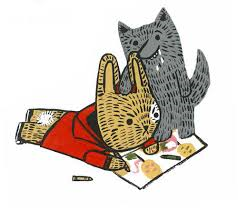 Lulu has taken a number of them under her wing in previous books: a duck, a dog, a cat, a rabbit, and a hedgehog. Each time she has proven her mettle by doing her very best to make a home for those pets. "Ratty did not become tame very quickly. Perhaps he had been poked too many times by Emma Pond's pencil for that. For days he tried to bite Lulu whenever she reached a hand toward him. He scuttled out of sight at every unexpected noise." Poor hamster! His behavior is not the only problem. Lulu and Mellie's nan doesn't like pets; she really doesn't like hamsters at all. The girls decide they will not tell her about Ratty. As Ratty becomes more accustomed to the changes in the way he is being treated, it's time to celebrate Nan's birthday with a weekend visit from Lulu and Mellie. How can they leave Ratty at home when he is just getting used to them? What will Nan say to having him accompany them? The girls know that Nan will not want anything to do with their new pet. With ingenuity and a great deal of planning, Lulu prepares to take Ratty along, unbeknownst to anyone but Mellie. You know that things are not going to just fall into place, don't you? Will they be able to keep their secret? I wonder. If you have a Lulu fan in your family or classroom, you know they are going to love having a new adventure to share. 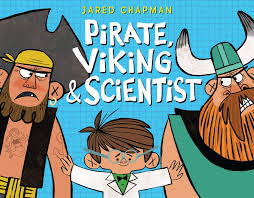 If not, you might want to think about checking out this terrific series for kids wanting to make the leap to chapter books. Go for it! "The next day, Lizzie watched a game instead of playing in one. It was strange to sit in the stands. In the fourth inning, a batter hit a weak ball to the third baseman, who dropped it. Lizzie leaped to her feet and nearly ran out onto the field. She loved baseball! She was better than most of the men! How could she give it up?" girls did not play baseball. Still, Lizzie practiced every day with her brother and watched every game that he played. "At bat, Lizzie hit two doubles, a triple and then a single. Once, she struck out. But that happened in the ninth inning and her team was already ahead 10-0. Lizzie tingled with happiness." That was all the players needed to know. Lizzie was now welcome to play anytime she chose. Lizzie followed other pursuits; baseball remained top of the list. Years passed and Lizzie realized her dream of playing amateur ball. It was obvious to her mother that Lizzie would have to give up baseball as it would not offer any real means of support for a woman. Despite her well intentioned advice, Lizzie could not just give up the game she loved. But, signing with a team did not assure a fair shake for a woman wanting to make a living as a player. It took determination and courage to ensure that she was paid as much as every male player. For seventeen years, she had a professional career ... the first woman to play on both major league all-star teams. Emily Arnold McCully uses watercolors and ink to create bright, realistic scenes from the early twentieth century. 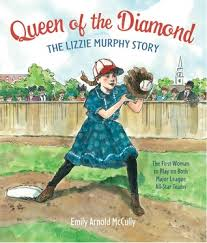 In doing so, she provides a history lesson for young baseball fans and extols the talents of a ground-breaking, capable female player. Back matter includes an author's note and a selection of source material. Science fair is over for this year; still, this would be a great book to read to those who see joy in all things science! On the front endpapers, young Scientist provides readers with a list of those words that mean something special to him. First, we meet his friend Pirate, and are privy to see the young boy using his scientific methods to score touchdowns with a cannon rather than a kicker. Moving on, we meet Viking who loves music and is skilled at archery. The text merely mentions that the young boy is friends with the other two. The boldly colored artwork provides the rest of the story. The trouble is between Viking and Pirate. They cannot be friends. Scientist's birthday does not provide enough incentive to change that. Pirate brings a gift. Viking brings the same gift ... only bigger. Pirate's welcome is underwhelming for the young scientist who is their friend. Maybe BIRTHDAY CAKE was the answer." Maybe that cake will put a smile on both angry faces! Nope, that won't work. Now, Scientist is becoming irritated. He won't give up. Is there another solution? PARTY GAMES are not the solution he is seeking either. Perhaps his calculations are misguided. In a final attempt to take two people who have so much in common and help them find a compromise, Scientist will try one more time. Using all of his scientific acumen, and having his friends answer a few questions, he is able to find common ground and acceptance. Now, they are all friends! That's the way to get a modicum of scientific learning front and center. Do it with aplomb, and good deal of brawling before finally considering commonalities. There's the ticket! It may have been more opportune to post this at the height of flu season. It may also have been just a bit too much while families and schools were dealing with the implications of spreading germs and for dealing with the outcomes. 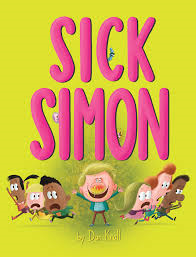 As you can imagine before you even start to read, kids are going to love the gross cover image of Simon, green slime emanating from his nostrils and waves of germs surrounding him. He makes all the other kids run, and that is what will delight those who love distasteful fare in their picture books. You know they are out there! Waking with his nose dripping green mucus doesn't bother Simon one tiny bit. He is ready for an awesome week at school. His father doesn't look much better. The kids on the bus do what they can to avoid him. (I love the little girl who looks as if she might be sick right along with him ... her face is a ghastly shade of olive). Simon's favorite place to be is school; obviously being sick is not going to hold him back. Spreading his germs on Monday, he's back Tuesday to care for the class pet, share snacks and offer his toy bunny from home as a show-and-tell object to be passed from child to child. His classmates are not eager to touch it ... who can blame them? 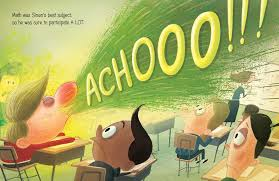 By the end of the week, there is no other child on the kickball field, no one riding the bus with him ... wait, there are three talkative germs. (Have you noticed them before now?) Disgusted by them or not, you may want to go back and check. They have high praise for Simon; only then does he realize the error of his ways. Next week, with his new learning, school might be even better than Simon can anticipate. There are many funny illustrations (also, disgusting) that will make those with weak stomachs blanch. Mostly, they will appreciated by Dan Krall's audience for just exactly that. The lesson taught is an important one, and done with humor and a light touch. Be sure it's on your bookshelf for the next time flu and cold season rolls around! "Queen Elizabeth I (1533 - 1603) loved clothes, and she knew that fabulous fashion impressed people. She may have owned as many as 3,000 gowns. The queen expected people in her court to dress well, too. For men as well as women, an outfit could cost as much as a house." Wow! If you have an interest in history, this is a perfect book for you. 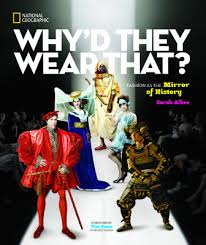 It is certainly made better if you are also interested in the clothing that people have worn throughout history, and why they actually did wear it? "Imagine yourself standing in a public square in ancient Rome on a typical market day. You would see teeming crowds of people dressed in a wide array of styles - freeborn Roman men in white togas; well-to-do Roman women, their hair elaborately coiffed and wearing colorful, flowing garments called stolas; laborers, children and slaves in simple tunics belted at the waist; still other slaves, as well as visitors from the provinces, dressed according to the customs of their homelands, some sporting beards, tattoos, sturdy boots, or leather trousers." Quite the assortment, isn't it? In the middle ages, they wore hair shirts, bound their feet, and even wore armor. This endlessly fascinating guide that speaks to the social and economic changes that affected what was worn at any time in history has much to teach us. History, and Ms. Albee show us the excessive steps that people would take to adapt to what was considered most fashionable at the time. Her writing is entertaining, while also not belaboring any points. In that way, we can look at clothing throughout history without readers ever feeling bogged down in the information shared. The color photos and well-drawn illustrations, accompanied by an abundance of useful and spirited captions, ensure that we can make the connections from one era to the next, and understand that one particular article might lead to the development of another. She cleverly makes the connection from the bug spray cans that soldiers had access to during WWII, and how they evolved into aerosol hair spray cans that allowed hair stylists to convince women to sport beehive hairdos which could be better controlled by hair spray! Every turn of the page led me to a new discovery, and often an 'aha' moment. Adding a timeline, an index, quotation sources, a bibliography, and suggestions for further reading adds to the appeal. Visually stunning, often humorous and very entertaining, leave it on your coffee table. You will return to reading it again and again, and learning as you go. Share it with students in classrooms, and history is sure to find many new fans. 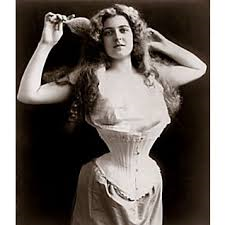 What a wondrous way to share stories and remember how clothing was impacted by, and did impact, so many historical events! "How will the reflection of our society look to future generations? What will your grandchildren laugh at? What will they view with horror? It may be fake tans, low-slung jeans, tattoos, yoga pants, dip-dyed hair, or snapback hats worn backward." they are actually human beings. them as covered in hair." This is another informative and entertaining book from Inhabit Media. I find them endlessly fascinating. So much of what is shared is brand new to me, and I suspect that others feel the same way I do. They are written well with children in mind, and provide a guide for extending our knowledge of the Inuit people. I knew nothing of the Tuniit. After having read about these mysterious people of the Arctic, I have something to share with others about them. Thanks to the Qitsualik-Tinsley team for bringing them to my attention, and now to yours. The book is divided into three sections: Inuit and Tuniit: Two Arctic Peoples, What Makes Tuniit Special, and What the Sciences Have to Say. They add a section on further reading as well. "Inuit love the Arctic, but they know not to trust it. And they're not just nervous about the weather. Many still believe in magical creatures that might hide behind every stone, in every ice crack, or far out beyond the sound of engines." 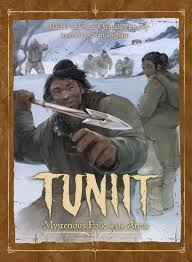 When the Inuit moved into the Arctic, they met the Tuniit who were real people. The stories told about them make them 'anything but normal.' They were able to communicate despite their differences which are many. Well drawn, detailed illustrations help readers understand the information being shared. There are also further captions provided in a lighter font to explain observations made. This is a terrific introduction to a most mysterious people. "Some opinions point to stories of conflict between Tuniit and Inuit, suggesting that maybe Inuit exterminated all of the Tuniit. Other sources, including stories of Tuniit and Inuit intermarrying, suggest that the two peoples blended together. If this is true, then it is the culture of the Tuniit that has gone extinct, while the Tuniit genes now reside within those who call themselves Inuit." "Instead, he opened his mouth up, wider than any normal person would open their mouth, unhinged it almost, snakelike, and a hot breath wafted into Rudger's face. It smelled like the desert might smell, dry and reddish and rotten with spice. It cut through the damp air, the overcast gray sky, the puddled tarmac. It filled Rudger's world." I had read an early review of this new book, and was intrigued by the premise. So, I was delighted to receive a copy from Vikki at Penguin Random House Canada last week. Once started, I tore through it. Imaginary friends are not the premise for many books, especially middle grade novels. My daughter had an imaginary friend when she was about 3, and we were constantly in trouble for not leaving a space at the table, or closing the door when it kept her out, or being careful where we were stepping. It was a most engaging, and often frustrating time. It's a real surprise to Amanda when she opens her wardrobe door one evening and hangs her coat on a boy! In fact, she doesn't believe it's true. She closes her door and sits down to take her shoes and socks off. As she works at the knots in her sneakers, she imagines what might happen if she can't ever get them undone. In trying to get rid of the muddy shoes and the cut laces, she again opens the door to her wardrobe and flings them inside, just as her mother comes into her room. Trapped, she waits for her mother to mention the visitor. Mom doesn't see him. "Rudger had woken up in Amanda's wardrobe just as she'd slammed the front door. He'd listened to her thundering up the stairs and stood quietly in the darkness, waiting. Where he'd been before that, he couldn't remember. If he'd been anywhere, it must have fallen out of his mind when he'd woken up. Now that he'd found Amanda, though, he had a feeling in the bottom of his stomach of rightness. As if he'd been made for her. As far as he could tell she was his first friend. She was also his only friend, and therefore his best friend." Rudger loves Amanda's brilliant imagination. He is pulled into her many adventures, enjoyable and not so. There's Mr. Bunting, who comes to Amanda's front door on a search for something. It turns out that the only way the man stays alive is by consuming imaginary friends. Ewww! That does not auger well for Rudger, does it? He also learns, when Amanda is hurt in a car accident and lies unconscious in the hospital bed, that his existence is in jeopardy. It seems that an imaginary friend fades when there is not enough imagination to keep them thriving. There is enough to scare them to keep readers moving forward. The strong characters are given life through exceptional writing, a strong setting and an imaginative and compelling story line. Emily Gravett's illustrations are perfect ... some full-color and double page spreads, others are made for the margins and the occasional single page. They give life to Amanda and Rudger, and a strong sense of the imaginary. Mr. Bunting and his eerie young woman companion add a disturbing quality. Sad, adventurous and even funny at times, this is a book you will not soon forget. Yes, it is imaginative, and important. The ending is perfection! 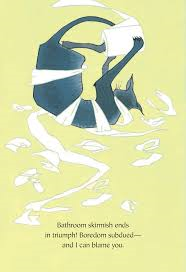 My own kids and my students at school loved to listen to Phoebe Gilman's Something From Nothing (Scholastic, 1993). The fact that it is still in print 22 years later is testament to their fine taste in storytelling. 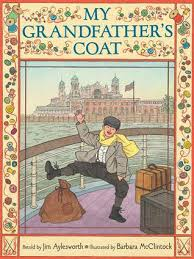 Lucky are the children today who can add Jim Aylesworth's My Grandfather's Coat to their shelf of similar folktales. Based on a Yiddish folksong, and celebrating those immigrants who crossed a cruel and vast ocean to make their way to North American shores, it is a book that is sure to stand the test of time. The first person voice of a grandchild tells the story of one man ... a young man looking for a better life. With hard work, he learned a new trade, found his own true love, and married her. To celebrate (and look handsome and debonair on his wedding day), he made himself a fine blue coat. He wore it until it fell apart. Then he fashioned from its remnants a very fine-looking jacket. He did the same with it ... and so on! The repetitive structure of the book is welcome and entertaining for a young listening audience. It has warmth and honors a strong work ethic, an ability to create something new from something old and much loved, and a story that bears repeating.
" ... he made a toy for you and your kittens! and you played with it. until at last ... you wore it out! "It's okay," said my grandfather. 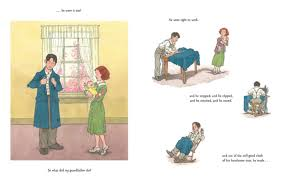 Barbara McClintock, as she has skillfully done on numerous occasions, here creates scenes in pen, ink, and watercolor that add a gentle feel of 'rightness' to Mr. Aylesworth's text. Her warm, touching artwork allows us to see the quiet drama of this grandfather's life played out on carefully designed pages. Time passes, with all of its many changes, and we are witness to history and a family's lasting love. Two stories, one in text and one in illustration, create a perfect whole. A note from both author and artist add context. if he wants his children to eat. Clara's father and brothers spend their days studying Torah. It is their life's work, while Clara and her mother do all of the work that needs doing. Clara knows early on that she does not want the life her mother is living. the bounds of this shtetl?" When the family flees Russia in the early twentieth century and arrives in New York, Clara goes to work to support them. She works in the garment industry where jobs are easy to find, pay is paltry, and conditions atrocious. Clara is clearly more indignant about the way young women are treated, and will not just accept this job as her lot in life. She struggles to learn English at night school and to get an education. During the day, she tries to encourage her co-workers to form a women's union to demand improved working conditions. She struggles to have a female voice heard in the already established male-dominated unions. She faces being fired from one sweatshop after another for her stance, multiple beatings, bullying, hospitalization, ignorance, even being thrown in jail; she never gives up. What she does give up is her dream to be a doctor, as she cannot abandon the young women whose lives are so hopeless. She is an amazing woman who encourages each one of us, after reading her story, to work to make the world better. Ms. Crowder's storytelling is impeccable. She captures the essence of her character, giving her a strong voice and an unflagging spirit. If you can walk away from reading this book without wanting to know much more about Clara Lemlich, I will be very surprised. If you are not clearly impressed with her unwavering fight for justice for women, I will also be very surprised. She was an unstoppable force, as is shared in an interview with her family in back matter. Also included there is an historical note, a glossary of terms and a list of selected resources. Bravo, Clara! Bravo, Melanie Crowder! Clean homes, messy homes ..."
Is home where your heart is? We know just by spending time with friends that 'home' can be very different from one person to another. 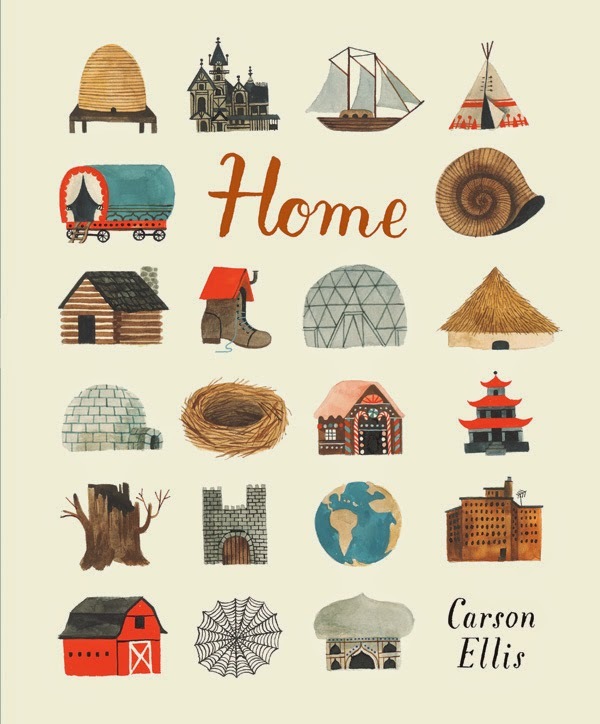 In Carson Ellis' exploration of homes, she takes us from the real to the imaginary, using the concept of home in all of its various meanings. Then, she comes full circle to the house in the country that is her home ... the place where she writes and lives her life. She ends with a question for her readers. On the pages in between the first and the last, she takes us on a journey of discovery. It provides opportunity for those sharing it to consider the concept of homes, and who they are meant to shelter. No matter who we are or where we live, we all appreciate that place we gladly describe as home. It might be the hollow in a tree, a shoe, or a tin hut. From a safe place, we can reach out and become part of a greater community. The more often you sit to contemplate its story, the more you will discover what makes us part of a greater world. Both whimsical and substantive, these are homes that pay homage to the variety in architecture, and to those who share those architectural spaces. In muted tones using gouache and ink, she creates diverse environments and invites readers to come in and share their stories and ideas by stopping occasionally to ask a quiet question. Imagination is at the heart of its meaning. Because of that, the possibilities are endless. Come in, feel welcome as you explore its lovely, elegant pages. and Ahab. They were tough. bottom of a pretzel bag. They were as weathered as a twisted stick of driftwood. 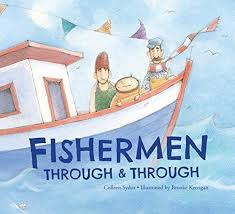 Yes, these three were fishermen through and through." I remember how much I loved the language the first time I read this book. I have read it on a number of occasions since then, and think I only appreciate it even more. It is a grand story of three friends who see their lives as slightly conventional. They spend their days on the water, and their evenings sharing stories with friends in a local restaurant. That does not mean that they have no dreams for themselves: Peter dreams of seas of sand, Santiago dreams of exploring the skies in a hot air balloon, and Ahab wants to lose himself in a field of endless flowers. "The three fishermen stared in silent wonder, for they weren't so weathered and salty and tough that they didn't recognize beauty when they found it doing the front crawl in their bucket." Wanting to share its beauty, they take it along with them to the Fisherman's Net and share its beauty with other patrons. Interest grows and word travels. Soon, there are many visitors wanting to talk to the fishermen and study the lobster. When offered money for it, the three are quick to say 'no'. However, as the amount of money grows exponentially, they begin to consider the possibility of fulfilling their dreams. What should they do? It takes much pondering, and a sizable amount of time to come to a decision that is right for them all. 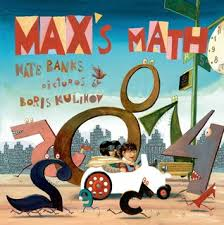 This is a delightful story to read aloud, with lively, lyrical language pleasing to the ear. The lovely blue-washed artwork adds texture and context for the youngest listeners, and for those who share this lovely story with them. "All I had to look forward to was my daily visit to the apothecary, to get fresh herbs for the poultice on Caravaggio's head. Salvatore seemed to enjoy my regular visits and chattered away to me about the people he'd known, the changes he'd seen in Napoli over the years and the disrespect that the new generation had for its elders. "Not like in my day," he asserted." I knew little of Caravaggio. I had never studied his works, or read anything about his life. So, I was interested in learning more when I received an email from Mark David Smith asking me to review his novel. I am always quick to state that my love of reading makes me no expert. But, I know what I like ... and I very much like Mark's book. Once I started reading, I had great difficulty setting it aside. I learned a great deal about Caravaggio and his art, about the tenuous nature of life in the seventeenth century in Italy, and about two complicated people whose lives became intertwined through a series of quite horrific events. It is fiction, but it has roots in history and certainly made me feel as if I were living right there with Beppo, an indentured orphan whose chance meeting with the artist changes both of their lives in the most significant ways. "Ranuccio and Giovan Tomassoni were brothers who controlled the alleyways and taverns from the Ponte District to Campo Marzio. Giovan was Capo Distrettuale, District Head, a position of authority just below magistrate. He was always bragging in the tavernas about how his family had served under the Duke of Parma, fighting against heretics." "The visitor was dressed all in black, silhouetted against the sunlight like a threat. I invited him inside. His clothes were tattered and filthy, as though he slept in them and never bathed: black leggings with holes at the knees; breeches and doublet faded to charcoal. Even his beard and the thick, curly hair under his hat were dark. Only his linen shirt and collar were white. If I had not known him, I might have thought him a beggar or a traveller who had been accosted by bandits - not the most famous painter in all of Italia." He wants the money that Beppo's boss owes him. The servant cannot help him. 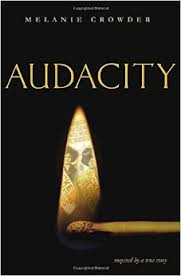 A murder, a worry that he might be blamed for it, and another chance meeting with Caravaggio, who has gotten himself into a jam with the Tomassinos, sets the two on a course that is filled with tension, fear, and flight. They become friends in exile. Caravaggio teaches Beppo to handle a sword. Beppo attends to the artist's needs, buying his paint supplies and caring for him when he gets himself into further trouble. He also acts as a messenger when Caravaggio hires the poor people of Napoli to be models for his work. It is through this work that Beppo meets Dolcetta, and falls in love. Flight to Malta and a frightening encounter with high seas pirates prove Beppo's courage and resourcefulness. By the time he returns, the artist is in need of help, he is a welcome suitor to the woman he loves and the course of his life is improved. It is obvious that Mark Smith has done his research. He has much to share, and does it in a way that allows us a clear look at a complex artist and his work, while never overpowering his story with too much information. We come away from the reading with knowledge of a life very different from our own, knowing a great deal more about the customs of Italy so long ago, and with elegant quotations we might add to our own gathering list. Are you in? I hope so. If you are, get ready for a fast-paced, dangerous, and ever-changing adventure. You will certainly enjoy the ride! Thanks for sharing your book, Mark. I am honored to been one of its many readers. Over the past few years I have been endlessly intrigued (and perpetually annoyed) by crows ... what I have learned from books I have read and shared, and from other sources as well. If you want to be astounded, check out this incredible documentary. It takes a bit of your time, but it is worth every minute of your attention, and is sure to give you a new appreciation for the intelligence of that noisy black bird. The annoying part, of course, are the raucous caws I hear while trying to enjoy a cuppa in the porch on warm spring and summer mornings. We have a few resident crows who make their home in a tree across the lane, and feel the need to wake the neighborhood early in the day. 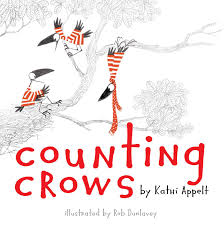 The 'counting crows' in Kathi Appelt's new book are not even vaguely bothersome. Instead, they are a group of sweater-wearing (even scarf-boasting) that are available with needed help in a counting game. I find them appealing, and I know that young listeners do, too. I have shared their story a number of times. Who knew that another counting book could have such charm? Their days are filled with fun: scavenging, flying, nesting, hanging upside down, perching on telephone lines, and cawing to beat the band. Then for the counting crows. 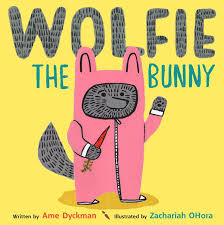 If you are looking for books that entice your children and students with lilting rhymes, and language that begs to be read independently, add this one to your list. Wonderfully designed, with appealing pencil and digital color illustrations, little ones will be aching to do the counting, repeat the rhymes, and run their palms over the textured cover! The always curious crows are appealing and well-placed on the pages to give readers ample opportunity to practice new skills as they ask to hear the book again. They stand out in the white space that surrounds them and keeps attention squarely on their jaunty positions and antics. An interfering cat gives them pause, and sends them off to look for a more welcome place to ply their trade. Counting is the name of the game; these bouncy birds make it a fun time! It was a baby wolf! US ALL UP!" said Dot. Dot is clearly aghast when her bunny family returns home to find a wolf cub in a basket on their doorstep. She knows they are in danger. Her parents know nothing of the sort ... they are totally enamored of this new family member. Dot is wary, and spends a sleepless night. Wolfie sleeps soundly beside her. Her parents are obviously unconcerned. They are in love with their new bundle of joy. Photos chronicle every new accomplishment, including carrots for breakfast. Dot repeats her warning. Her parents are too busy to listen. Her friends concur with Dot's take on the situation and take their play to another house, and yard. After they leave, we see the first hint of sadness for the new sibling. He misses his sister, and is quick to attach himself to her every move once she returns. Dot is not impressed with the drooling, or the close quarters. Wolfie grows quickly, much too quickly for Mama to keep up with the daily shopping. Dot and Wolfie are sent to get a new supply of carrots. Dot has reservations. A threat to her new brother sees Dot defending him in the face of danger. Wolfie is ever grateful! 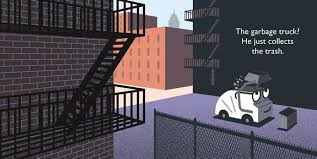 In an artist's note, Zachariah OHora explains that his artwork is done using acrylics, and that he has made the setting for the story his former neighborhood, Park Slope, Brooklyn. He creates perfectly appealing characters using bold black outlines. The expressions leave no room for misunderstanding the way that those characters feel at every moment. The neighborhood details add depth, and humor. 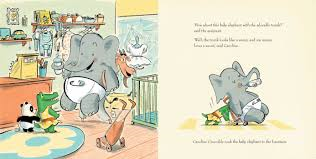 This charming, witty book is sure to become a family favorite, new sibling or not! my beauty snooze? Duty calls! playthings with feathers or fur. So whose toys are these? 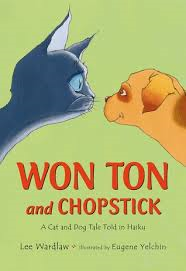 Won Ton is back, and with just as much attitude as in his first book ... (Won Ton: A Cat Tale Told in Haiku, Henry Holt, 2011). He loves his life with Boy, and the family. He has a routine to his days, and he doesn't like to veer away from it. Suspicion rears its ugly head when Won Ton notices that a door, always open, is now closed. A peek around the corner negates all hope that a simple mistake was made. Eager to establish dominance, Won Ton pounces and is immediately thwarted in his efforts to talk the family into taking that puppy back. After much deliberation, the puppy is named Chopstick. Won Ton would prefer Pest! Won Ton tries to set guidelines; in doing so, he finds himself confined to the backyard. No matter how hard he tries to have the puppy put out, it is Won Ton who finds himself 'out'! The haiku form sparkles in this tale, capturing the conflict between one established and one apprentice pet. We feel Won Ton's resentment and Chopstick's naivete as they learn to cohabit. Eugene Yelchin uses graphite and gouache to give personality to both and to add a touch of light and a good deal of energy to this winning newest collaboration. I love that Basho gets an honorable mention! I do hope that you have met Max and his brothers in past books. This is the fourth in a series that introduces young children to various concepts. In this one, the focus turns to numbers. Max is intrigued by them, finding them everywhere he looks. He's building a car and needs two more wheels to make it run. Once up and operational, Max is off in search of problems. His brothers want to tag along. Cruising down the road all three find numbers at every turn. Leaving the highway in hopes of discovering whether the number they find on the side of the road is a 6 or a 9, they come to a crosswords. They let the traffic policeman know that they are on the lookout for problems, and he offers two destinations ... Shapeville or Count Town. Both are certain to satisfy them. Shapeville is a mess. A storm has blown away all of the squares. Max has a solution. That solution leads to a smidgen of trouble, which Max can easily fix. Once again, he uses his knowledge of math and shapes to get he and his brothers back on the ground. Their crash landing leads to a sorting problem which is soon solved. Then, it's on to Count Town for a rocket launch. Everyone is going! When they get there, some numbers are missing, including zero. Without it, they are in big trouble at the launch site. The pace is quick, and the textured bold colors of Boris Kulikov's compelling artwork offer much for young readers to discover as the pages are turned. What a fantastic world he has created to accompany Ms. Banks' strong storytelling. Look, and then look again; you are sure to find something new each time. Cardell is a perfectly happy young coyote, despite the fact that his daddy lives so far away with another family. He has the attention of both loving parents and thus, he loves the life that he lives. We learn quickly that Cardell's daddy makes wonderful pancakes, plays exciting games and howls with the best of them. Staying with him only part of the time affords the young coyote the opportunity to spend the rest of his days with his mama. The two are content with their life. From his mama Cardell learns that being a good scout means a full tummy at the end of each day. He learns to paint, just like his mama and to appreciate all that nature has to offer. "Yep, apart from a few sticker burs and occasional sand fleas, Cardell's life was mostly wonderful." Everything changes when a new neighbor moves in and dares to show up at their door with gifts for Mama. Cardell is not impressed; Mama most certainly seems to be. There had been other coyotes courting his mama. None had the appeal that Otis has. 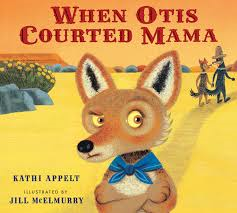 Otis is unlike any other suitors, or Cardell's daddy. Cardell is unwelcoming. Otis is patient. settled on Cardell's fur like a warm blanket." Now, Cardell's life is even better than he ever thought it could be! 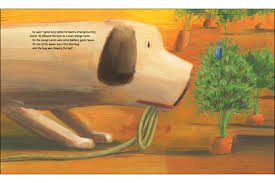 A reassuring tale complemented by gouache paintings that depict the desert life of the Southwest, this is a terrific book to share at story time. "I wish it was spring right now,"
"Waiting is hard," she said. "Right now it is time to sleep." Soon she was softly snoring ..."
Spring is on its way to us in Manitoba! The water is flowing into nearby gutters, kids are outside in sweatshirts throwing and catching snowballs, walkers pour past the house all day long and the sun is shining brightly providing above freezing temperatures for days in a row. The weather network reports that it is going to continue through the next two weeks! What? 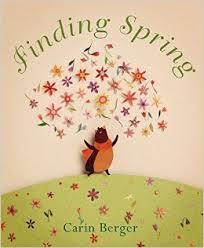 It sent me to the den and the book pile that awaits posting for a second look at Carin Berger's lovely story of a bear cub searching for spring. It is his first and he can't wait to welcome it. His mama warns him that it will take patience as she settles in for her long winter's nap. Maurice pays no heed to her gentle message; he sets off on his own to find spring right now. Along the way, the other forest animals provide the same advice as his mother has given him. Aha! As we go, we are cognizant that Maurice has not yet experienced winter's long sleep. He is adamant that he will find spring and looking for it is his purpose. 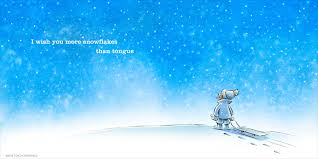 When snowflakes make both the sky and ground around white and cold, Maurice finds his way back to his mother and their winter den, finally accepting that spring will come in its own time. His job is to wait for it, and to sleep while he waits. Imagine his wonder when spring finally does arrive with warmth, budding branches, rushing water and brilliant color. "The illustrations in this book are assemblages created using a combination of cut paper and found ephemera. Each piece was then photographed digitally to prepare the full-color art." An apt description for the innovative and beautifully designed paper collages that will leave young listeners and their parents awe-struck at the detail and intricacy of each spread. These dioramas boast bold colors, changing design, and a true sense of dimension and texture. Exceptional! "So, is that why you're late?" I don't know if you met this young man in Davide Cali's most enjoyable I Didn't Do My Homework Because ... (2014). If not, I hope that you will enjoy his many excuses for not being on time for school. I suspect that you will enjoy it as much as I did. It was great hit when I visited school classrooms in February! Anyway ... he's making a return visit, and this time he is doing his best to explain to his perplexed and demanding teacher the reason (or many reasons) for not making it to school on time. The story is, of course, a long one that begins at the breakfast table where 'giant ants stole my breakfast.' That tiny detail leads to a host of complicated excuses that he hopes she will believe. Each time the answer is no, and he regales her with ever more complex and convoluted reasons. He wanders in and out of fairy tales, assists a farmer in sorting out his livestock and even flies the president's private plane! As you would expect, the teacher is skeptical of every excuse given; in the end, the boy gets the last laugh and readers will be completely satisfied. The artist has a surprise in store, as he has had on every single page until the end. This final one is testament to the truth telling that has been going on throughout the morning's conversation. Close the book, and your listeners are sure to be anxious to try their hand at creating some of their own excuses. 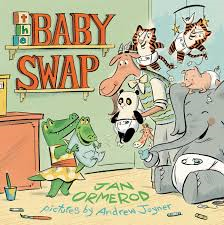 Who doesn't love a well written tale of sibling rivalry when a new baby arrives? 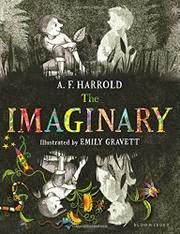 Adding to the joy of this book for me is that it was written by Jan Ormerod, a terribly accomplished Australian writer-illustrator whose work I have always admired. 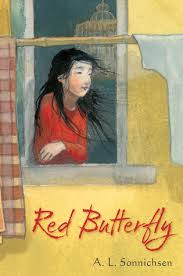 Her death at 66 a year ago was a great loss to all who love children's literature, and her legacy is one of wonderful, warm stories that focused on the beauty that is a young child. So, it is no surprise to meet Caroline on the title page and to immediately recognize her distress at the attention being paid to her baby brother. The family has just been on a shopping trip that resulted in a brand new hat for her mother, obviously a paragon of style in the crocodile community. As they make their way home, Mama is full of praise for the baby's color, eating habits, his snout and his adorable scaly skin. Each new remark gets a reaction from Caroline ... not one of them admirable. Their next shopping excursion (to return Mama's new hat) leaves Caroline in charge of the baby, and outside the door of The Baby Shop. It seems the perfect place to swap him for something better! The shopkeeper is accommodating and quickly offers a 'soft and cuddly' panda. Seems like a good choice to Caroline. The swap is made and the two are off to have a snack at a nearby eatery. Of course there are problems. It turns out that the cafe's outdoor furniture is made of bamboo. You must know what baby pandas like to eat! Once again, the shopkeeper does his best to make Caroline happy and offers to take the panda back in exchange for another baby animal. Each new exchange results in great difficulty for a child trying to find a more acceptable baby than her own brother. In the end, she is surprised at what really makes her happiest of all. Understated humor and lively dialogue will have readers quickly turning pages to see what happens with each return. Andrew Joyner's detailed artwork and expressive characters add to the fun, and perfectly match the engaging tone of the book. I am pleased to share this new story about Tanzania with you. 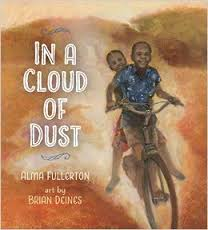 Alma Fullerton is a thoughtful writer whose concern for children of the world is evident in the powerful books she has written. Brian Deines creates beautifully intense artwork to complement the warmth of this story from Africa about a young girl named Anna. School proves a challenge for her. Attendance requires exceptionally long walks each day. When the school day is done and the walk completed, there is rarely time for catching up with homework. It is simply too dark to work at it. So, she uses her lunch hour to get it all done for tomorrow. In doing that, she misses the chance to choose a bike from the BICYCLE LIBRARY truck that stops to unload free bikes for the school's children. Her heart hurts for having missed the chance; Anna is happy for her friends nonetheless. She helps them learn to control their new means of transport. When the time comes to return home following the school day, Anna scoots quickly alongside her friends as they ride. Upon reaching Mohammad's home, he has a surprise for her! "About 50% of people in the southern Africa countries are what their governments consider 'stranded' (with no access to any motorized transportation) or 'survival' (with very limited access to motorized transportation). Bicycles are vital to such communities. Not only do bicycles help many of these people get to their jobs and schools, they also create jobs for people through sales, bike repairs, and libraries." This new book is a lovely companion to A Good Trade (2012) and Community Soup (2013). 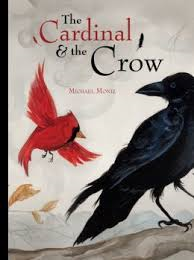 Taking a page from the teachings of Aesop, Michael Moniz has created a pleasing and witty story about Crow, whose life is made miserable by the constant 'chirping' of the many and varied birds who share his range. Their interminable teasing makes his life miserable. One bird in particular takes undue pleasure in persistent insults. warbling voice. All the other birds followed his lead." Crow becomes so tired of the constant, annoying chatter that he begins SQUAWKING every time another bird comes near. This assures peace and quiet, and no company to share his days. Once the other birds fly off to warmer climes, Crow and Cardinal are left to enjoy the chilly weather in close proximity. Crow, showing age and experience, tries to warn Cardinal that danger many be lurking nearby. know what might be hiding somewhere below." The last bird that Cardinal is likely to regard as a mentor is Crow, of course. He pays no attention, and that is his first and biggest mistake. Luckily, Crow holds no grudges. It takes a bit of flattery and a whole lot of wisdom to ensure that his nemesis will live to see another day. Lucky Cardinal. The story is effectively and quickly told. Cardinal and Crow are strong characters, and bold in their presence on the pages of this welcome book. 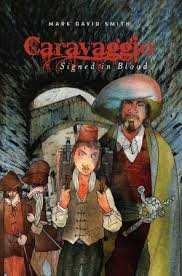 its gardens and bridges ... "
I am, once again, awed by the powerful story that can be told in a verse novel. Kara's strong, sorrowful first person narrative is divided into three separate parts ... Crawl, Dissolve and Fly. As we read from one to the next we learn about the feelings that Kara is struggling to untangle and the mysteries of the life she has been leading in China. She is a Chinese child with a disability who lives with a white, older mother. They have little money. She cannot go to school. Her mother is reclusive and not forthcoming with the circumstances of Kara's earlier life. Mama does promise that the day will come when they can travel to Montana to live with Kara's father. As Kara pieces together her story she learns that when her Mama found her abandoned, she made the decision to stay in China and raise the poor baby. When the authorities discover that Mama has no official papers, Kara is placed in an orphanage awaiting adoption. A family from the United States expresses interest in taking her into their home in Florida. They have previously adopted other children from China. As she makes her way in a new and unfamiliar world, Kara shows that she has the will to survive despite the odds and the many complex issues that ultimately change her life for the better. lets me open the computer again. I pound with my regular hand. When a blizzard stops the mighty trucks of the city from working, it’s SUPERTRUCK to the rescue! It's hard to believe, living in Manitoba in the middle of the Canadian prairies, we have had to shovel very little snow this season. Each day we hear and read reports of storms that persist in other parts of the country. Today we are experiencing very strong winds and shivers because of them. But, our snow plows have experienced a pretty severe lack of work. 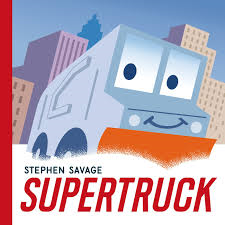 In the city that Stephen Savage creates for his hero, there are many trucks. Each has an important job to do! In graphic, boldly colored illustrations he shows us what those jobs are and the joy the trucks feel when solving problems for city dwellers. But, when the snow begins to fall and the streets become impassible, those trucks have little recourse but to sit idly by and wait for help. That is exactly when the bespectacled and innocent-looking garbage truck finds a secluded garage where he can turn into SUPERTRUCK! Without his glasses, sporting bold square lines, and working under cover of darkness, he makes his way from one side of the city to the other. He does his work without any help and with great pride, clearing streets and leaving the other trucks to wonder the next morning about their new hero. We know what he is doing. I bet he can hardly wait for another snowstorm! Appealing and clever, I am sure this is a book that you will share over and over again ... and I don't think you will mind. leaves was a tiny blue bug. "I don't know what he looks like," the farmer said, "but he's been stealing all the carrots, berries, beans and cherries. Go catch him before he eats my whole farm!" He sees the bug at every turn. Max can't get close enough to slow him down. A pig, and then a goat do their best to encourage Max to continue on, while munching berries and beans to their heart's content. Finally, three crows listen to Max's description of the thief and add their two cents' worth. When he assures himself that the bug is truly gone (missing another blue bug sitting on the fence), Max returns triumphantly to the farmyard. The animals prepare a party for the rural detective, leaving us with a perfect surprise ending. 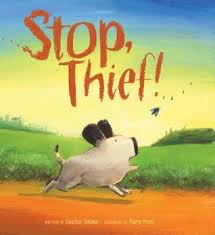 As I have mentioned before, the best picture books result from a perfect pairing of scripted and visual text. Pierre Pratt uses gouache to add another layer to this humorous and most enjoyable detective romp. His full page spreads have story going on the background as we trail Max on his search. This visually rich book shows his penchant for diagonal lines to show motion, his warm color palette and the expressive face of his main character. He also shows young readers exactly what is happening, while Max appears totally oblivious to the facts presented in the artwork. Fun to read, and funnier to observe the actual goings-on, this is a book that should be shared ... and often! "Monday is vocabulary day, when Mr. Daniels goes over the new words for the week. As far as reading lessons go, this isn't so bad. All I have to do is listen as he tells us the word's meaning, and I can usually remember it because I make mind movies about each one and that helps me remember. I've always had one important rule in the classroom, which is to try to lay low." I love and admire Ally Nickerson! I love Ally's mind movies! I love Ally's Sketchbook of Impossible Things! I love her big brother, Travis! I love her new teacher, Mr. Daniels! 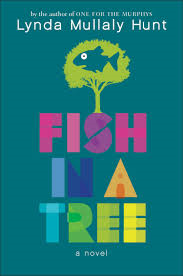 And I love FISH IN A TREE ... let me tell you about it. "I watch a mind movie of her taking a stick and drawing a line in the dirt between us under a bright blue sky. She's dressed as a sheriff and I'm wearing black and white prisoner stripes. My mind does this all the time - shows me these movies that seem so real that they carry me away inside of them. They are a relief from my real life." When Mr. Daniels is hired as a substitute while the classroom teacher is on maternity leave, things begin to change. He sees Ally's strengths and focuses on those, eventually giving her the confidence to share her struggles with him, and to ask for help. All the while, we are completely aware of how bright, intuitive, strong and funny Ally is through her powerful first person narrative. She knows herself very well and is fully that her brain works differently when it comes to learning to read and write. She doesn't need others to know. Mr. Daniels is not the only one who sees what is wonderful about Ally. She has two terrific friends in Keisha and Albert. They are strong secondary characters who want to be her friends, and who appreciate her sense of humor, her feisty responses, her incredible stories and eventually, her secrets. Travis is the big brother we all would want to have, or be. He gives her strength while struggling with his own learning problems. He shares his dreams, and he loves Ally unconditionally. This portrait of dyslexia and its repercussions for one young and admirable girl is so well drawn. The shame felt and perpetuated by misunderstandings is clear through Ally's impeccable voice. In the end her story is hopeful, and a worthy follow-up to Ms. Hunt's first book, One of the Murphys. You should read both. They are books for your heart! "Keisha laughs again. "One thing's for sure. We're not going to fit in, but we're going to stand out. All three of us. You wait and see. You're going to be a famous artist and Albert is going to cure cancer or invent talking fish or something." "Talking fish? What would they say? 'Please don't fry me?'" I push the door open, and her face is just like I imagined. "And you're going to have a big baking business, right?" "Maybe in my spare time. I'm also going to rule the world." I laugh. Then swallow hard. "Thanks for being my friend, Keisha."